Saigon Pearl apartment for rent 3 bedrooms, 1 kitchen, all the furnitures almost new, high quality sofa, curtain and other appliances, such as dinning table, 42 inches tivi, DVD player, fridge, washing machine, microwave, Modern- Luxury- nice design for two guests are highlighted with river view in addition with 1 nice single bedroom. 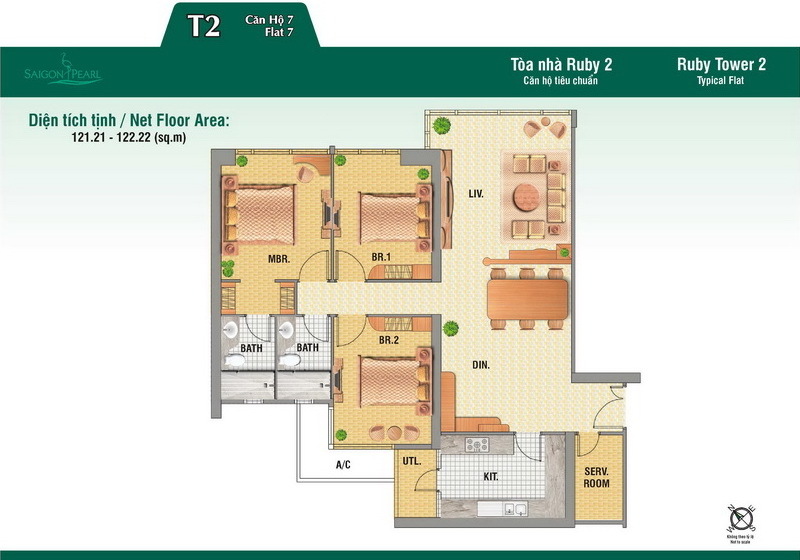 This apartment in block Ruby tower 2, 2nd floor with 122 sqm. View to park inside Saigon Pearl. Price for rent 1100 usd/month. Saigon Pearl apartment for rent with furniture and interior with 2, 3 and 4 bedrooms. Saigon Pearl is located at 92 Nguyen Huu Canh, Ward 22, Binh Thanh District, is a real estate development project built elaborate and most voluminous in Vietnam so far. is conveniently located just 5 minutes from downtown, 5 minutes to Ben Thanh Market, 15 minutes to Tan Son Nhat airport. We have many apartments for rent in The Manor, Saigon Pearl, City Garden, Thao Dien Pearl, The Estella and all apartment for rent in HCMC. We always have cheap price for you. Saigon Pearl apartment for rent, Ruby tower 2, unit 1 9th floor view to Vinhomes Central Park, 2 bedrooms with total using area of 85 sqm, which include: - 1 living room - 2 bedrooms - 2 bathrooms - 1 dining..
3 bedrooms Apartment for rent in Saigon Pearl, fully funished, in 8th floor block Ruby tower 2, beautiful view, fresh air, very quite, has total using area 135 sqm. Nice design including: 1 living room, 3 bedrooms, 2 bathrooms, 1 dining..